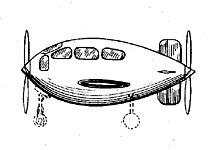 I recently stumbed across Adventure Lounge's Early Aircraft Design, a fascinating look at old patent drawings for mostly unbuilt aircraft from the 1930's, 1940's, and 1950's (nothing whatever to do with Northern California GA flying, but as I've said before, I'm a sucker for this sort of thing). John recently remarked on the odd looks of the Beech Starcruiser (and I said something similar about the Piaggio P180 in comments on his posting), but some of these are quite bizarre even by that standard. Some others are just toys; some look very conventional. Whatever the size -- giant four-engined seaplanes or small runabouts -- they're nearly all bristling with propellers. Very futuristic in that inevitably-dated way ("Nothing dates as quickly as the future..."). The odd shapes make you realise just how standardised airplane designs are now (for good reason, for sure). (Slow) evolution in action, I guess. I found it interesting to see so many deigns that made it to at leat the hardware stage, and some that saw production, including the Douglas DC-4E, Lockheed Electra, Sikorsky S-42, Curtiss XP-55 Ascender, Bell FM-1 Airacuda, Lockheed P-38 Lighting, Fairchild C-82 Packet and XC-120 Packplane, Hughes XR-11, Lockheed XP-58 Chain Lightning, Northrop P-61 Black Widow, North American F-82 Twin Mustang, Vultee XP-54 Swoose Goose, Douglas XB-42 Mixmaster, Northrop XP-56 Black Bullet, Consolidated XC-99, and Republic Seabee. There may be others, but these were the ones I could identify at a quick glance.